Fantasy football is (almost) always about looking for what’s next. But it can be just as important — if occasionally less fun — to look back. One down year can mean the beginning of the end for a player, but it can also mean a blip. The key is divining which it is, and whether you need to invest in a comeback candidate. Today, we’re looking at some of the prime bounceback candidates for 2019. These guys were for one reason or another disappointing in 2019, but we can see a path back to relevance. One thing seems fairly certain: Anderson won’t actually be on the Rams next year. Todd Gurley’s there, and while Anderson has proven to be a more-than-capable understudy in his brief tenure with the Rams, there will doubtless be suitors for the increasingly Tolbert-esque back. The thing is, though, that it never made sense (at least to me) that he’d have been so forgotten coming into this year. Anderson was PFF’s seventh-graded running back in 2017, tied with Duke Johnson and ahead of … well, most everybody. His 2.78 yards after contact per rush weren’t exactly world-beating, but the average bordered on top-20 status in the league. 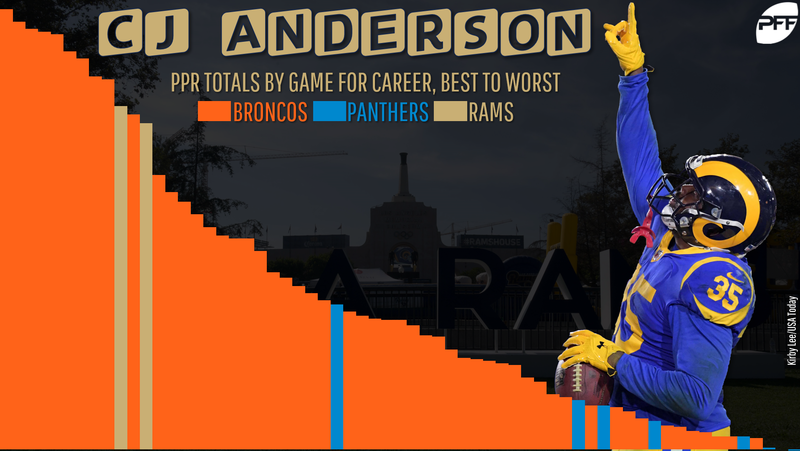 Anderson turns 28 in February, and while he’s not likely to ever carry the type of workload he did in Denver or what he was doing down the stretch for the Rams, his brief Los Angeles tenure (4.00 YCo/Att., 83.8 PFF grade from Week 16 through the Divisional Round) showed there’s still enough in his legs to get a gig. Anderson can be the Derrick Henry to someone’s Dion Lewis in 2019, and that’s enough to make him a high-ceiling flex play. Will Baldwin get back to full health in 2019? That’s the deciding factor here. After missing Week 14 to injury, Baldwin came back in Weeks 15 and 16 with a combined 203 yards and three touchdowns, fourth only to Antonio Brown, DeAndre Hopkins, and Robby Anderson in scoring over those two weeks. After all the grief the Seahawks took for an overreliance on the run in their playoff loss, and considering Russell Wilson remains one of the league’s best quarterbacks and Baldwin and Tyler Lockett are a strong 1-2 pair of receivers, expect Baldwin to bounce back … if he’s healthy. With a big season in 2018, Coleman would have been in line for a big payday in 2019. Instead, he was very ordinary. Despite Devonta Freeman missing essentially the entire season and Ito Smith missing a chunk of the year himself, Coleman only reached 800 rushing yards, barely above his 747 in a timeshare the year before. He was efficient — 4.8 yards per carry, 2.9 yards after contact per rush — but didn’t offer a very high ceiling, only cracking 100 rushing yards twice all season only topping 60 three times. Still, he’s in line for a decent payday somewhere (at least as running back paydays go these days) and should enter 2019 as the lead back for whatever team signs him. He finished 2018 was the PPR RB19 mostly on the back of health and stability, but if he can dominate the touches in a backfield, he has high-end RB2 upside. 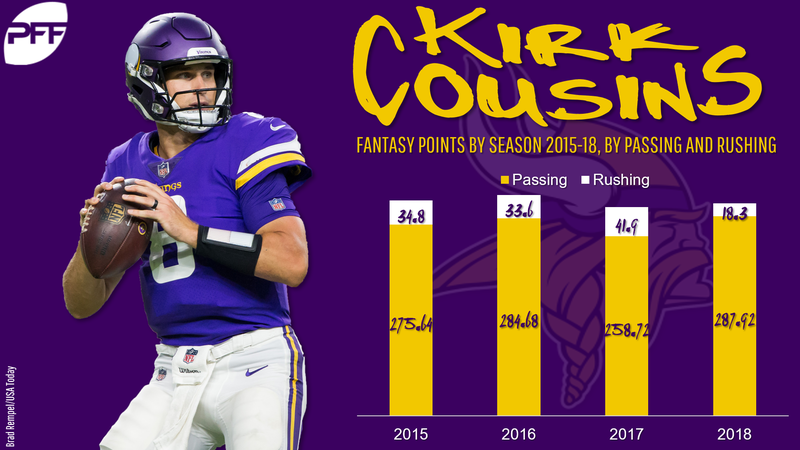 Dirty little secret: As a passer only, Cousins was … more or less exactly the same guy for fantasy in 2018 as he had been before. He averaged 4,186 passing yards and 27 touchdowns his last three years in Washington; he had 4,298 (second-best of his career) and 30 (career-high) with the Vikings. It was as a rusher that Cousins’ fantasy numbers dropped off. He ran for at least four touchdowns each of the previous three years, then ran for only one in 2018. Give Cousins the three extra rushing scores, and instead of being QB12 in 2018 he’d have been QB7, right in line with his fifth-, fifth- and 10th-place finishes in Washington. So far in his career, Fournette … hasn’t actually been good. Even in 2017, when he finished as the PPR RB9, Fournette averaged only 3.9 yards per carry (tied for 35th out of 67 qualified backs), and that fell to 3.3 in an injury-and-suspension-abbreviated 2018 season. His 62.4 rushing grade in 2017 was 48th at the position; it climbed to 67.8 this year, which is only good in that it was an improvement. Here’s the thing, though: That doesn’t really matter. By all accounts, despite the turmoil, Fournette will be back in Jacksonville for 2019, and that means he’s likely to keep the bell-cow role because the Jaguars need help everywhere else on offense. The team had a sub-66.0 grade at every facet of its offense. They’ll definitely need a new quarterback, might be looking for a receiver and will be exploring offensive line help. All of that with … negative cap space. Per Over the Cap, the Jaguars have the second-least amount of cap space for 2019 (only the Eagles are worse off), the result of having gone all-in on the defense. They’ll clear some, of course, and will find places to spend. But Fournette is serviceable enough that the backfield won’t be a priority. He might never be as electric as fellow fourth overall pick Ezekiel Elliott, but Fournette is going to dominate carries out of a backfield that will need him. He’ll bounce back to high-end RB2 status. I’m not entirely sold on Freeman as a bounceback for 2019 just because he had already been slipping as a fantasy asset — his PPR points-per-game average had fallen in consecutive years, from 21.2 to 17.8 to 14.1. But with Coleman hitting free agency and likely the consolation prize for one of the teams that loses out on Le’Veon Bell, and Ito Smith not likely to be a full-time candidate, Freeman’s going to get the bulk of the carries for what should continue to be a potent Atlanta offense. If the best ability actually is availability, Landry at least checks that box in bold Magic Marker. In five years, he’s played 80 games, which amounts to approximately zero absences. Landry’s end-of-season numbers looked largely the same at the end of 2018 (1,036 yards from scrimmage, 5 TDs) as they did at the end of 2017 (980, 9), with one significant difference — receptions. 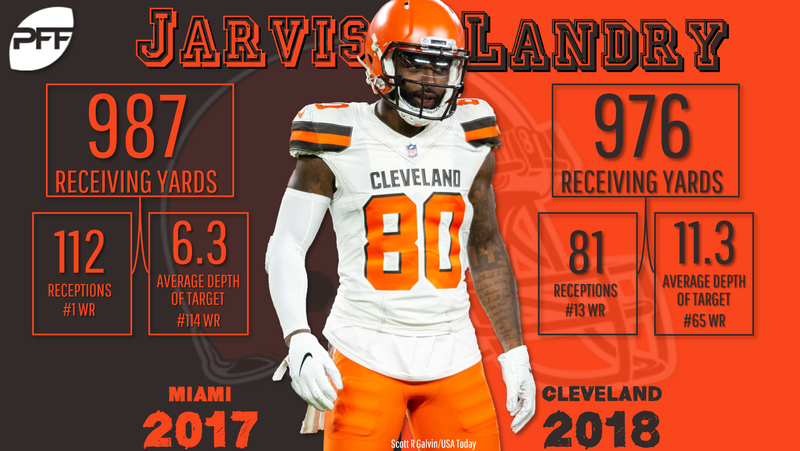 Landry went from a low-depth-of-target guy in Miami in 2017 (his aDOT of 6.3 yards ranked 114th out of 118 qualified receivers) to decidedly average in Cleveland (11.3, 65th of 126). That explains why he had roughly the same yardage despite 31 fewer receptions, and why his PPR rank among wide receivers fell from fourth to 19th. With a full year of Baker Mayfield, a revamped and promising coaching staff, and little question about who is the No. 1 pass-catcher in the offense, Landry might continue to be a deeper target guy than he was in Miami, but his reception total should rise, bring him back to low-end WR1 status. I have this unsupported hypothesis that players who get hurt in the first couple weeks of the season are the easiest to forget about. Players who get hurt in training camp/the preseason dominate the headlines, because they are the only headlines. Players who get hurt later in the season have had enough of a year that we’ve been following. But injuries in Week 1 or 2 get lost in the shuffle and don’t get the preseason publicity. Enter Walker, who made it all of 39 snaps in Week 1 before injuring his ankle. With Jonnu Smith failing to distinguish himself in Walker’s stead and nothing much from the wide receiver position after Corey Davis, the door is wide open for Walker to reclaim his role in 2019.